多言語DAISY図書で多文化共生社会を創造しよう！　Towards a society full of diversity through DAISY! Towards a society full of diversity through DAISY! “DAISY”stands for Digital Accessible Information System. DAISY is a worldwide standard of digital text, which　DAISY Consortium (please check here) has striven to introduce around the world for the disabled people (the blind, the people suffering from weak eyesight, people with learning disability, especially dyslexia). In the U.S. it is obligatory for schools to provide a DAISY book for disabled students, should they request one. It is seen as “Reasonable Accommodation”, which is guaranteed as a human right by the federal low. Therefore a lot of DAISY books are being made for them. Since September 2008, The Barrier-Free School Textbook Act has been enforced in Japan. The DAISY textbooks in elementary and junior high schools have begun to be distributed to the disabled students from the public internet site. We think this universal design digital text is also very useful for the foreign students for learning Japanese as well as their own language. Rits-DAISY is now making multilingual DAISY digital books in order to support foreign students. The members of Rits-DAISY include university professors, graduate students, undergraduate students and other volunteers. It was founded in January 2009 when it began to support the foreign students in Kyoto and Shiga areas. Firstly we collaborated with Japanese-Brazilian school: “Colegio Unificado Asia-Brasil” to make a multilingual DAISY story book in 2009. In 2010, we began to collaborate with a pre-school for Japanese language education towards newcomer students in Konan City, “Sakura Kyoshitsu”, to make DAISY textbooks for its 3 months’ curriculum. Between 2012 and 2013, we supported an Indonesian student at Omuro Elementary School in Kyoto. Now we are supporting the world classes of Ishibe-Minami Elementary School in Konan City and Hino Elementary School in Kyoto City as well as the special education classes for disabled students. Let us show you an example of our assistance towards an Indonesian girl at Omuro Elementary School. Normally she was attending the common class even though she could not understand Japanese. Because she was the only newcomer in this school, she was receiving assistance in learning Japanese at an after-school class. At first, she could not follow at all her teacher in the common class and also could not communicate well with her friends. 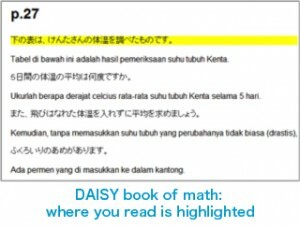 However, after receiving our support, she claimed “By using DAISY book, it becomes easier for me to understand what I’m studying in my classroom”. The parents also commented “Our daughter has begun to study harder than before. Now we can understand what she is studying at her school”. Please look at a picture above on the left. Her friends joined her during the after-school lesson. Soon enough she started teaching her friends Indonesian language through a multilingual DAISY book. Such a joyful experience gave her necessary confidence to do well at Japanese school. Now because of rapid globalization, many young students accompany their parents who want to find out their jobs in foreign country. The young students face great difficulties learning a new language and at the same time keeping up with their mother tongue. We think the multilingual DAISY books help foreign young students overcome such problems. The figure on the right expresses our idea of the international support system through DAISY focusing on the relationship between Japan and Brazil. We think it is very important for us to collaborate to make this kind of an international support network in order to break through immigrants’ education problems. 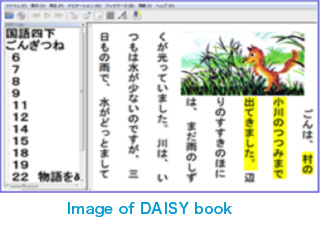 If we can make an international support network, it will be easier to make the multilingual DAISY book for them. This project contributes toward building the “Inclusive Society” and raising the level of basic education all over the world. What are the merits of DAISY for foreign students’ education? DAISY text is a very efficient tool for learning languages, because each sound of sentence synchronizes with its corresponding written character. It is possible for DAISY text to stimulate the sense of hearing and the sense of sight at the same time. If we can make the multilingual DAISY textbook, it becomes easier for us to educate simultaneously the foreign students in their own language and the host country’s language. When foreign students go to the public school and their parents cannot understand the host country’ language, a communication gap arises between them. The multilingual textbook promotes the communication between the students and their parents as well as between school teachers and the foreign family. The DAISY tool is very useful in order to support a young foreigner who cannot go to school. Due to economic factors, it happens that some young foreigners cannot afford to go to school. To solve this problem, DAISY makes a contribution both financially and technically. If we can build the support network, we can accumulate the knowledge of how to build a mutual support, thus everybody can easily share this knowledge thought the support network. Firstly, our aim is to enhance sharing the multilingual DAISY books which are made by volunteers around the world. KISSEL (Ibaraki University project) helps and assists our project. Secondly, we would like to share the work and papers, the aim of which is to build a society where everybody can enjoy reading books, even though they may be physically handicapped. Thirdly, we naturally aim at activating the network and fruitful relationship with anyone or any organizations, interested in supporting our project using the DAISY and other digital tool. When you use the data downloaded from our sites, please make sure you read and observe the Copy Right law. We try to do our best to make DAISY books as useful as possible. However, the quality of our work is at times inadequate because we largely depend on volunteer work. After getting permission from us, you can revise the DAISY file in order to improve its quality and usability. We would like to cooperate with anyone or any organization who share our aims, and we would appreciate if you gave us any useful information or advice. Copyright © Rits-DAISY. All Rights Reserved.